Habitat : Cultivated in india as an ornamental tree. Uses : Bark is anti-bacterial, anti-fungal, analgesic, analeptic, anthelmintic, antispasmodic, aromatic, , carminative, diaphoretic, , stimulant, narcotic and tonic. It is used as nervine depressant in case of hysteria, epilepsy, chorea and convulsions. It acts as stimulant for cardiac, circulation and respiration. It is useful in measles, typhoid, whooping cough, asthma, and hiccup. It is recommended in case of cough, cold, toothache and liver disorders. Camphor oil is antihelmintic, antirheumatic, antispasmodic, cardiotonic and . It is used for treating joints and muscle pains, cold sores and skin diseases. 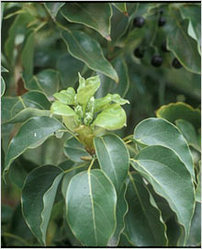 Camphor oil is best used for sedating nervy types particularly when associated with depression. Also used an aromatherapy diffuser or vaporizer.